Now you can celebrate the end of tax season (whether you received a refund or ended up owing them this year) with some cool Tax Day Freebies!!!! Bananas Smoothies & Frozen Yogurt: On April 15, get a FREE small frozen yogurt at Bananas Smoothies & Frozen Yogurt. Just mention the offer at the point of purchase. Available while supplies last. Limit one per customer. Click here for more information. California Tortilla: On Tax Day, all customers can score FREE chips and queso by saying “1040” at checkout. Great American Cookies: Stop by a Great American Cookies location on April 15th, and get a FREE Original Chocolate Chip Cookie. No purchase required. You can click here for more information. Hardee’s: will help taxpayers rise and shine with one free sausage biscuit on April 15 from 7 a.m. to 10 a.m. at participating stores. Be sure to say “made from scratch” in order to unlock this Tax Day freebie. *There’s a limit of one biscuit per customer. Hot Dog on a Stick: Get one FREE Original Turkey or Veggie Dog on April 15 at Hot Dog on a Stick. No purchase necessary. Click here for more information. HydroMassage: FREE Hydromassage with this Printable Coupon. Click here to find a HydroMassage location near you! Kona Ice: will have their trucks all over the country to give out free shaved ice on April 15 to give you some sweet relief to your Tax Day woes. Stop by the truck and you’ll get a free cup of shaved ice. Click here to see where a Kona Ice truck is near you. Menchie’s: Download the Menchie’s app by April 15, and get a free $5 frozen yogurt. Once it is downloaded, the Menchie’s Money coupon will show up automatically in the app. Office Depot & Office Max: Get a FREE 5 lbs. of Shredding when you use this coupon. 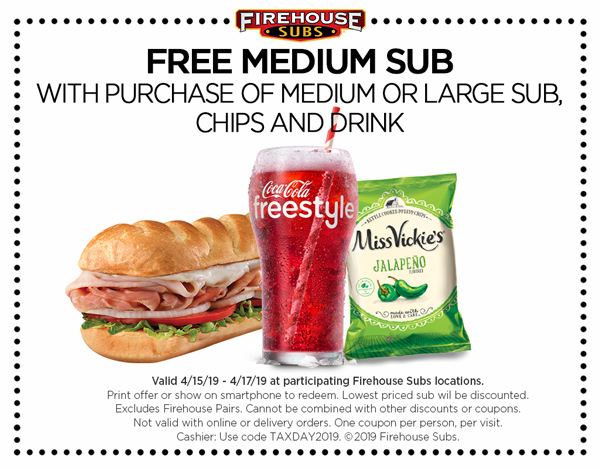 Schlotzky’s: Get a FREE small The Original sandwich with purchase of a medium drink and chips on April 15 at participating Schlotzky’s Bakery Cafe locations. Click here for more information. 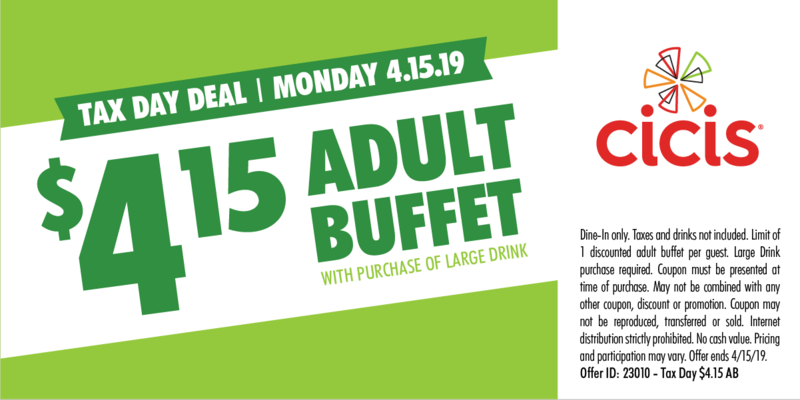 Cici’s Pizza: Participating Cici’s locations are offering a Tax Day discount, an adult pizza buffet for only $4.15. All you need is this Cicis coupon. Dunkin’ (Dunkin Donuts): DD Perks® Rewards Members a Medium Hot or Iced Coffee for $1 all day, Monday, April 15 at participating Dunkin’ restaurants. Click here for more information. Orbitz: On Monday, April 15, Orbitz will match the amount paid in taxes and fees in Orbucks. Click here for more information. Be sure to keep checking back as I will be adding more as they become available. Also, if you know of any other Tax Day Freebies, please let me know so I can add them to the list.